Located in the Company’s Garden is South Africa’s oldest cultivated tree, the Saffron Pear, at 360 years old. The tree’s genetic value was preserved when Tru-Cape took bud graft material from the tree in 2013 and propagated this on rootstock. Equivalent to cloning, the buds retain exactly the same genetic characteristics as the original tree. The City and Tru-Cape planted a cloned sapling next to the parent tree, preserving the new generation of the Saffron Pear tree for another few centuries. The oldest cultivated tree in South Africa still lives in the Company’s Garden enclosed by a cast-iron railing and supported by poles and braces due to its extreme age for a tree of its species. The Pyrus communis or Saffron Pear tree is approximately 363 years old this year and was planted during the time of Jan van Riebeeck. “The visit was opportune as they requested cuttings of bud material from the tree in order to make grafts to preserve this original species of pear. We agreed that when these grafts had matured to sapling trees, some would be returned to be re-planted. This would preserve this historic specimen for years to come. The practice of propagation by grafting preserves the genetic purity of the mother-plant and, as such, is a “clone” of the parent plant,” said the manager of the Company’s Garden, Rory Phelan. Another of the saplings will be planted in the VOC vegetable garden’s orchard section and it is hoped that both trees will grow for another 360 years. 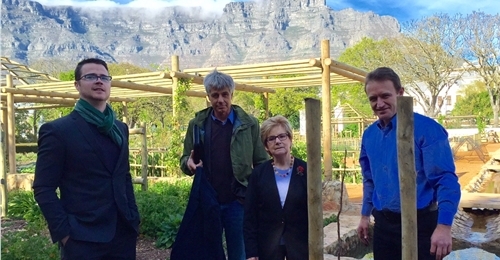 “We need to preserve what we have so that future generations will know the history of the fruit tree industry in the Western Cape which was started years ago by dedicated gardeners who cultivated the first fruits at the Cape of Good Hope,” said Alderman Walker. Roelf Pienaar, Tru-Cape Fruit Marketing’s managing director, says Tru-Cape has a responsibility to preserve genetic history for future generations. “Sharing a Saffron Pear with the Company’s Garden is one step closer to ensuring future generations will know it too,” he said.? ?The Saffron Pear tree standing to this day is all that is left of a circle of Saffron Pear trees planted in the middle of the Company’s Garden hundreds of years ago. On 19 April 1665, Van Riebeeck wrote in a letter: ‘The weather was not so good for vegetable crops last year, but the wine was successful. Thirty apples were picked from six trees and two pears’. The trees were described by a visiting pastor, Valetijn, who visited the garden in 1685 and 1714. In 1853, the trees were again described to be about 150 years old from a description of a Russian visitor to the Cape who said he saw a circle of huge pear trees growing in the middle of the Company’s Garden. It is reported that in 1910, a large pear tree with Wisteria growing onto it fell down, and the Wisteria was subsequently trained onto a pergola. Near to this was a remaining pear tree which once probably formed part of the circle of pear trees described earlier. This is the tree which grows in the garden to this day and the Wisteria still grows on the adjacent pergola.